Mathias Bengtsson, Spun, 2005/2012. Dimensions variable. Carbon fiber. A new show at Industry Gallery in D.C. is exciting new interest in Spun, even though the series was designed a decade ago. Why? 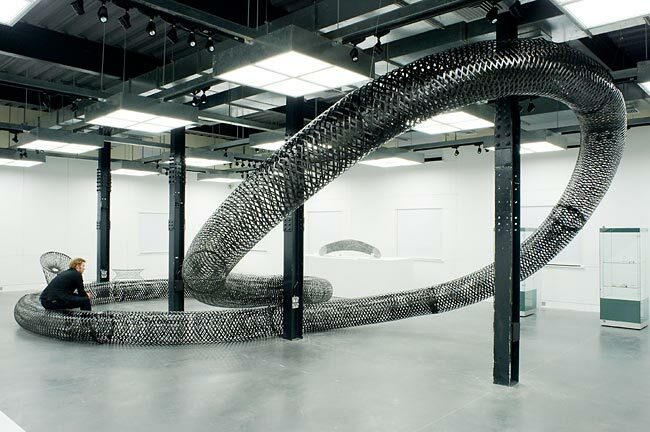 Because the curators of the show asked Bengtsson to weave 12 Spun benches into a single sinuous tube that spirals around the gallery in a figure eight. Since each bench weighs only a few pounds, the mega-bench doesn’t weigh more than 11 or 12 pounds. And while it may not look structurally sound, it is: visitors are welcome to relax where it touches down on the gallery floor. “The pattern of the fibre is designed to produce maximum strength from minimum material–only 20% of the surface is carbon,” Bengtsson told Design Museum. Carbon fiber is notoriously expensive (think road bikes or climbing gear). That’s because it’s usually made by hand. The difference here is that Bengtsson is using an industrial fabrication technique in which a robot arm spins around two rotating discs, pulling a thread of carbon into a form dictated by a 3-D model. The final piece is then cured in a kiln, sealing its shape in place. It’s how NASA rapid prototypes things, and it’s far quicker and less expensive than handmaking carbon fiber objects. From space to your living room, just one example of advanced technology that NASA begat. What other potentially amazing future technological advances might we miss out on if we continue to shortchange space exploration in the name of crashing budgets here on earth? Exhibition: INDUSTRY announces SPUN: An Installation by Mathias Bengtsson, May 12 – June 29, 2012, Washington D.C. Filed Under: Design Tagged With: calendar, carbon fiber, Mathias Bengtsson, technology, Washington D.C.